Moments after the beautiful 19-year old Alessia Cara blessed the stage at Squamish Valley Music Festival on Saturday, among the piercing screams and thunderous applause, a strangely sweaty onlooker beside me tapped my shoulder and said, “She is f-cking amazing. Who is she?” I immediately filled him in, and watched his face light up as he tapped her name into his notes on his iPhone, only to ask moments later, “How do you spell that?” Moments like those are all collateral of Alessia, currently occupying a strange place in music. She might possess one of the most incredible, refreshing voices in pop, yet she only has one single under her name. The sullen and petulant ‘Here’ was most of the world’s introduction to Alessia Cara and is the ultimate anti-party banger that delivers and astounds on plenty of levels. Her explosive voice made famous through her YouTube-famed covers of pop favorites cuts through the track and is equal parts sugary-sweet and dominant, the Issac Hayes sampling instrumental offers a retro nod to an 80’s classic while feeling modern and ballroom-chic, but hands down the most impressive component of Alessia’s first original offering to the universe is her writing. Alessia flawlessly places the listener into her gone-sour party experience while flowing with a relentlessness and shine reminiscent of a rapper. No, really. In contrast to the formulaic and nursery-rhymed pop hits that usually consume radio, Alessia Cara utilized a timely flow that sounds more like a rant or stream of consciousness and just when you feel that she’s about to run about of breath, she masterfully steps back and slaps you with a wave of tender melodies. Few artists get to where Alessia Cara currently is, and frankly, even fewer do what she is about to do. The Canadian songstress is poised to stun and woo the masses with her eclectic, genre-blending debut EP Four Pink Walls dropping August 28th through Def Jam Records, and a full length album to follow shortly in the Fall. With #AlessiaSeason in full effect, I was lucky enough to talk to her over the phone just days after watching her tear down the stage. It might feel soon, but in reality, she’s been racking up respectable amounts of views on her YouTube videos she’s been posting since she was thirteen. Most of them are covers of hit songs with her strumming away at a guitar and belting out notes in front of a webcam, while others are videos of her interacting with her fanbase and showcasing the same coy, soft-spoken girl I was on the phone with. With that said, YouTube views aren’t exactly as effective as a measure of success in the same way festival stages and chart-topping singles are. “I’m really new, so I think a lot of people don’t know who I am yet” she admits, acknowledging her unique position. Of all the things I had read about her process crafting her album and EP, the most interesting anecdote was her work with Malay Ho, a producer known for crafting the sonic landscapes and producing a majority of one of the greatest, most renowned albums in modern history, Frank Ocean’s channel ORANGE. Alessia is remarkably strategic and ambitious about the days ahead of her. When asked about following up her smash hit, she is quick to throw away the concept of catering to anyone or anything. “I don’t ever like to try to make a hit or write a ‘next single’,” she explains. As she prepares to drop two projects before the year’s end, the balance of impact and longevity is something Alessia has her sights set on. As she strives to create bodies of work that will speak to her generation, she isn’t afraid to admit that she looks to great albums of the past as a blueprint, specifically citing her love for fellow Ontario-native Drake’s modern classic, Take Care. “I mean, you remember the singles, but it’s not like you remember it for the number one singles. 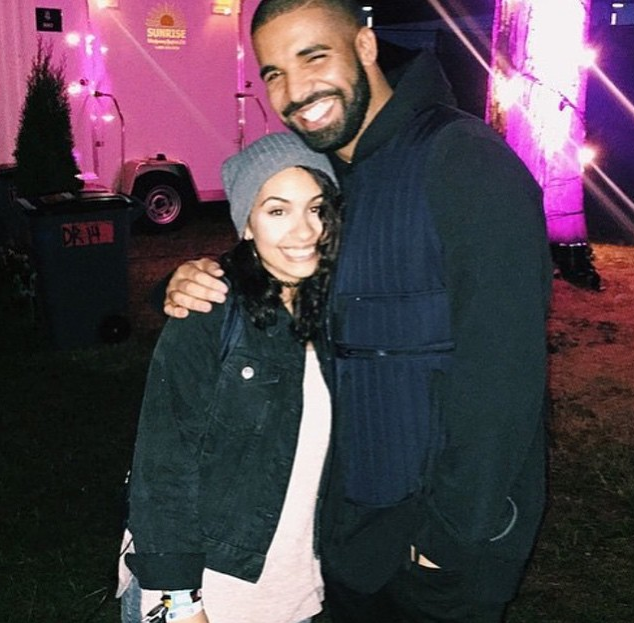 You think, ‘Drake had an amazing, classic album,’” says Alessia. “That’s what I want it to be. It’s really about making it a project and a body of work rather than just a whole bunch of singles or a whole bunch of songs that are just forced together and call it an album.” It’s moments like this that open my eyes to how methodical and serious Alessia is about her craft. She’s not just in this to be the talk of the blogosphere for a couple months. She doesn’t just want the song of the summer. She isn’t just on some “happy to be here” mentality. She is fixated on the idea of legacy and affecting the world with quality, brilliant music. Alessia’s appreciation for Drake has been well documented and has evolved into a running-gag in most of her previous interviews as she’s called him out repeatedly and pleaded for them to have an interaction. Hilariously enough, I was originally supposed to interview Alessia in person at Squamish, but a wrench was thrown in her schedule when she was randomly blessed with a DM from the 6 God himself moments before he took the stage, resulting in their first, much anticipated encounter. After our many pauses of laughter and incessant giggles, she walks me through the process of wading through security and ultimately approaching his trailer to which Drake emerged and voiced his enthusiasm to meet her. “It was the best 5 minutes of my life”, she reflects, but it was probably pretty awesome for Drake too. After all, he had just met one of music’s most promising voices in a very, very long time. Purchase Alessia Cara’s single ‘Here’ and look out for her Four Pink Walls EP released August 28th through Def Jam Recordings.